Rafa Benitez is a man of the people at Newcastle United and he’s also built a career on a frequent rotation policy. It was, therefore, rather strange to see how hesitant he was to change things when results took a sharp turn recently. Trouble has been brewing in paradise as fans began to turn on each other; some insisting others weren’t being supportive, others then calling out Benitez, claiming he wasn’t immune to criticism. That he has never been and never will be. But no one has ever disputed as much. 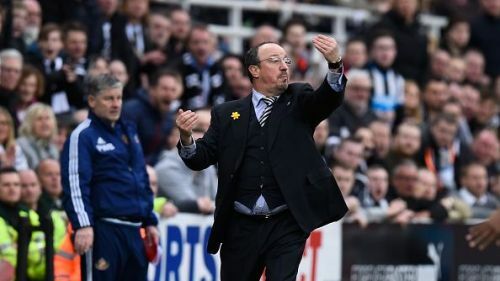 Unsurprisingly, after the cracks began to grow during Saturday’s loss to Watford at St James’ Park, Benitez called on everyone to stick together; the primary target of that message was the fans. But the players looked arguably more disjointed. They needed a swift reminder too but proved themselves by fighting back from 2-0 down to get a point against West Brom at the Hawthorns on Tuesday night. Rotation was the word of the day when the team news came out. Five changes were made as Chancel Mbemba, Mikel Merino, Isaac Hayden, Ayoze Perez and most surprisingly Karl Darlow came in for Javier Manquillo, Mohamed Diame, Jonjo Shelvey, Dwight Gayle and Rob Elliot. Benitez later insisted he had not dropped any of his players but succumbed to the need for fresh legs. Prayers had been answered and the team looked much more balanced. Merino’s inclusion was perhaps the most pleasing, but not everyone was smiling. Despite not scoring in eight games, Joselu kept his place up front; the loudest voices wanted to see Aleksandar Mitrovic start, but it was Gayle, most recent scorer for the Magpies, who was arguably the unlucky one to miss out. Benitez is not only trusted by the vast majority of Newcastle supporters because of his previous trophy record, or even his special bond with them but because there is always logic in his thinking. No matter what the decision, it is always thought through; he doesn’t shoot from the hip and therein lies his uneasiness in trusting more erratic characters like Mitrovic or Mbemba, but faith in Joselu and Perez. Professionalism and hard work are more important to him than quality. Chants from the stands ask why he bought Joselu, or demand Mitrovic’s inclusion. But if a player can’t score, he must work hard for the cause and keep their discipline. When Benitez made the call to persuade the striker to leave Stoke City for Newcastle in the summer, he knew he wasn’t going to score a high amount of goals. But as he has reaffirmed since, his budget didn’t cover one who did. It would be harsh from his point of view to start expecting that from him now. Even with Shelvey’s exclusion, perhaps his biggest mistake looking in hindsight, had reasoning. Newcastle had been opened up far too often over the past 180 minutes of football, conceding seven goals to Manchester United and Watford. Their principles had been lost and, although Shelvey could not be held personally responsible, the opportunity to tighten things up in midfield by pairing Merino and Hayden was there. As one of the best passers of a football in England, Shelvey is the player who can change a game in an instant for Newcastle. The first half display showed just how the visitors didn’t quite have the balance right. Useless possession and a lack of chances meant that, as the game wore on, it became a case of getting to half-time level on terms. Without injured captain Jamaal Lascelles, though, the defence has not been organised enough to soak up that sort of pressure, even from a fairly blunt West Brom attack. For the third game running, Newcastle conceded on the stroke of half-time; Shelvey could have provided a much needed attacking outlet, and although Matt Ritchie looked dangerous at times, it wasn’t until substitutions were made that Newcastle looked like going for it in any way. For the fourth consecutive goal conceded, DeAndre Yedlin was caught out of position at right back and it was incredibly easy for West Brom to score after Kieran Gibbs’ cross was nodded in by Hal Robson-Kanu. Yedlin has been impressive in a Newcastle shirt overall, but a weakness is developing down the right-hand side. It cannot be exploited any longer. Sam Field netted his first senior goal after the break, before an immediate reply from stand-in skipper Ciaran Clark sparked a comeback. Jonny Evans’ own goal completed it; just like many of Newcastle’s goals this season, both came from superb Ritchie set-piece delivery. With Chelsea away to come on Saturday, getting the result was the most important thing. Had they not, it would have been tough to avoid six successive defeats against Antonio Conte’s free-scoring Blues. The fight shown answered tar harshest critics of both Benitez and the players, but an answer must be found for a poor first half. In Hayden and Merino, it is clear to see Benitez’s ideal midfield blueprint, most evident at Liverpool. Javier Mascherano and Xabi Alonso complimented each other perfectly; one won the ball, the other controlled the tempo. Steven Gerrard would then play ahead, with more freedom to create with long passes or join Fernando Torres up front. The Hayden-Merino dynamic is very much the same but with no discernible number 10 available, it is hard to move forward. Stamford Bridge may not be the place to fit Shelvey in alongside Merino. But it may be worth getting him to mirror Gerrard, perhaps not as far forward as Gayle has been playing or Perez did on Tuesday night. 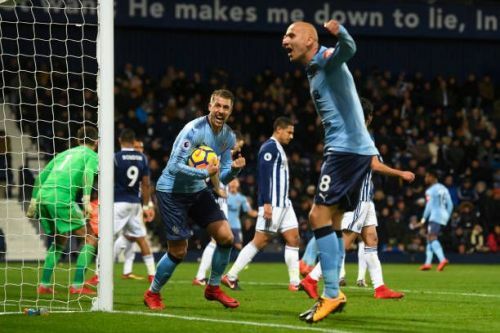 Newcastle stopped the rot against West Brom, containing Chelsea is not going to end well; Shelvey must return to add a new dimension to the midfield, but that doesn’t necessarily mean losing any solidity.